STOKE CITY had narrowly avoided relegation at the end of the 1981/82 season and manager Richie Barker knew he had to strengthen his squad to avoid a repeat. Things weren’t looking too good though as the 82/83 season rapidly approached, with Barker making just one signing – George Berry on a free transfer from Wolves to replace the departed Denis Smith – and poor form in pre-season saw the bookies install The Potters as firm favourites for the drop. 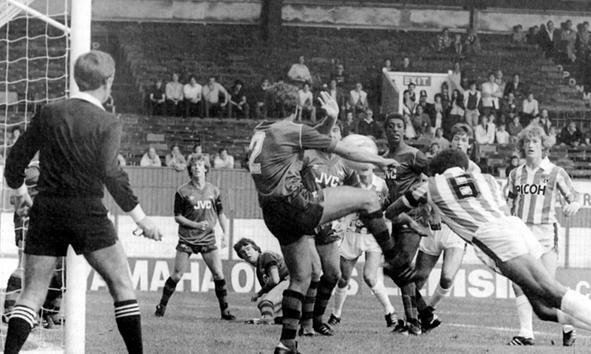 Having missing out on several targets, Barker finally managed to do more business in the days leading up to the season’s curtain-raiser against Arsenal with Mickey Thomas arriving from Brighton for £200,000 and Mark Chamberlain and goalkeeper Mark Harrison making the short journey from Vale Park for a combined fee of £185,000. The big transfer deal of the summer involving Stoke though had been the departure of Lee Chapman to none other than Arsenal for £500,000. Chapman had done himself no favours with some rather ill-advised comments about his former club and was assured of a less than warm welcome on his return to the Potteries…not that he wasn’t used to that; even scoring 34 goals in 99 appearances in the red and white stripes hadn’t spared him from the Victoria Ground boo boys! Stoke’s three debutants received a warm welcome from the home fans in the crowd of 15,504 and the effervescent Thomas immediately won them over as his enthusiasm and tenacity enticed Chapman into a challenge which earned the new Gunners striker a quick booking. The jeers for our former star quickly turned to cheers though when Stoke took the lead after just five minutes. Rory Delap’s throw ins may have made headline news in recent times, but back in the early eighties, The Potters were renowned for another deadly set-piece routine – the near-post, flick on corner! An early Chamberlain run at Kenny Sansom led to the England left back conceding a corner, and when Thomas’s left foot inswinger was nodded on by Brendan O’Callaghan, George Berry was on hand at the far post to bravely force the ball home. Apart from the Boothen End baying for Chapman’s blood at every opportunity, the rest of half passed by without further real incident, but the game – and the career of one of our new signings – was to unexpectedly burst into life just five minutes into the second half. Chamberlain received the ball on the right wing and in a moment of breathtaking skill and electrifying pace, left Sansom for dead before whipping over an inch-perfect cross which O’Callaghan despatched with aplomb in front of an ecstatic Boothen End. The Stoke fans, many of whom had grown up spoiled by a succession of great wingers, including of course the very best of them all, had found a new hero. Chamberlain was sensational during a second half performance which was simply unforgettable. Sansom, who had played in all but one of England’s five matches during that summer’s World Cup Finals in Spain, was taken to the cleaners. He was beaten on the outside repeatedly and on one memorable occasion, when he tried to force Chamberlain onto his left foot, our man simply pushed the ball inside him and sprinted around the back of the beleaguered full back, off the pitch and onto the red cinder track before picking up the ball to put in another cross! By now, Arsenal’s only recourse was to stop Chamberlain by foul means, and referee Clive Thomas incurred the wrath of the home support when he waved play on after centre half David O’Leary’s blatant body check had stopped our winger going clean through on the Gunners’ goal. The only blot on Stoke’s copybook was an Arsenal consolation goal, scored by Alan Sunderland, but it was of no consequence and Stoke ran out worthy winners. The Boothen End rose to acclaim a couple of new heroes. Mickey Thomas and particularly Mark Chamberlain , their boots off to relieve their sore and aching feet, received standing ovations as they left the field. It was a Stoke performance that set the benchmark for much of the first half of that season and the fans were treated to some outstanding football. Chamberlain – whose form quickly earned him a spot in Bobby Robson early England squads – destroyed Birmingham almost single-handedly in a 4-1 win at St Andrews and there were other big wins against Swansea and West Ham as well as an unforgettable 4-4 draw with Luton at the Victoria Ground. The free-flowing football of that era may not have lasted long, but boy, was it fun while it did!